Gardeners in Northern and Southern California can enjoy fresh-grown citrus. Whether orange, grapefruit, Meyer lemon or lime, citrus trees enjoy the temperate California climate in Central and Southern California; Northern California growers should choose a cold-hardy citrus such as kumquat, yuzu or tangerine. Plant citrus trees in the dormant season, late winter to early spring, and choose a container citrus tree. Choose a location for your citrus tree that allows the tree enough room to mature. Select a site with well-draining soil and full sun exposure. Citrus fruit needs full sun to ripen properly. Prepare a hole for your citrus tree that's twice the size of the container citrus plant's root ball. Once you've made your hole, dig up the grass in a 3-foot radius. You'll cover this area with mulch later; this helps keep the soil moist near your tree's roots. Remove any rocks, weeds or tree roots from the hole so the young citrus tree won't have to compete. Remove the citrus sapling from its container. Break apart the root ball with your fingers and untangle any tangled roots to prevent the tree from suffocating and possibly dying later. Place the tree in the prepared hole and spread the roots out with your fingers. Check to ensure the tree is straight then fill in the hole with your soil. Water the newly planted citrus tree until the ground becomes saturated and the soil compacts around the base of the tree. Mulch the area around the tree where you tore up the grass. Construct a watering ring around the base of the tree by raising up the soil in a 4- to 5-inch circle, thus creating a basin around the trunk of the tree. Fill this watering ring to hydrate your newly planted citrus. Water the tree this way two more times during the first week, and twice a week for the next three weeks. Then switch to once weekly watering. After four to six months, the watering ring will dissolve and you can water via hose. 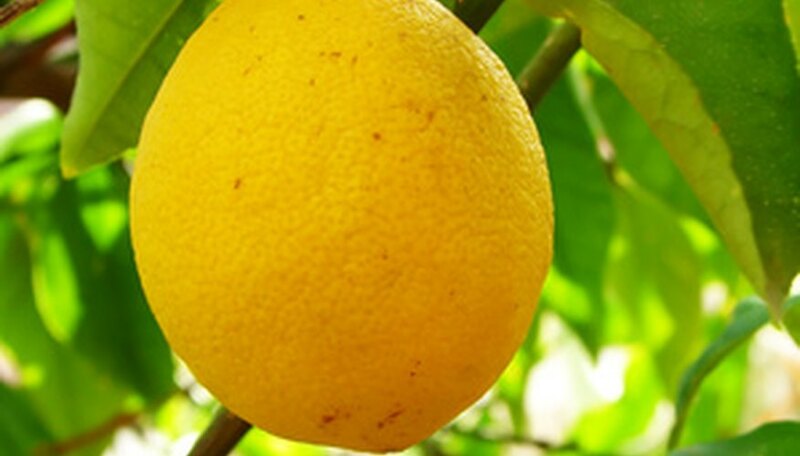 Wait to fertilize until the newly planted citrus tree begins to grow again. Then fertilize monthly from February through October by scattering dry fertilizer around the base of the tree and watering to work it in. Four Winds Growers recommends an all-purpose fertilizer or one that has a 2-1-1 ratio on nitrogen-phosphorous-potassium. Follow the suggested guidelines on the fertilizer package. Prune your citrus tree only to remove dead, damaged or broken growth and to strip suckers from the tree trunk. Prune during early spring once you've harvested citrus fruit.